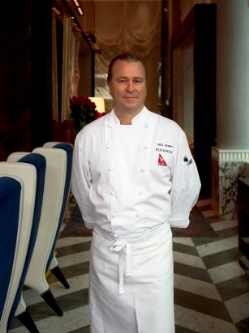 Neil Perry is one of Australia's best known and most influential chefs. He has managed several award-winning restaurants in Australia, and today concentrates on his flagship brand, the Rockpool Group, which includes Rockpool Sydney; Rockpool Bar & Grill Sydney, Melbourne and Perth; Spice Temple Sydney and Melbourne and Rosetta. Neil is the author of numerous cookbooks and a TV presenter on the multi-award-winning food program, Food Source - Neil Perry, which also aired on the BBC and more recently appeared as an Iron Chef on 'Iron Chef Australia'. He also creates the menus for Qantas Business and First Class passengers redefining in-flight dining and service. He has an infectious enthusiasm for food, wine and travel. This July Neil will share his passion for Italian food at a special dinner on Saturday, 27 July at The Lodge at Kauri Cliffs, New Zealand. Neil's favourite dishes from his latest Melbourne restaurant, Rosetta, will feature on the menu, each matched to sublime Italian wines. Italian food features when you cook at The Lodge at Kauri Cliffs In July. What regions of Italy have influenced your cooking and the menu of Rosetta? One of the advantages of not being Italian is that I can take inspiration from all over Italy. Italian chefs often tend to stick to their region cooking roots. At Rosetta we have pastas from all over Italy form the rich pastas of the north , one of which takes 48 egg yolks - to the more simple fare of the Neapolitan area where the pasta is almost more like a noodle. My wife (Samantha) and I drove from Milan around the Piedmont region. For two or three days with a driver we were just travelling and stopping wherever we saw interesting food or wine. The wine in that region is so good, the vineyards around Barolo especially. Unfortunately I wasn't there at the start of winter which is white truffle season but we were there in spring when the entire apple blossom on the trees looked so beautiful. I haven't been to Sicily yet but it is on my wish-list. Spice Temple represents a foray into more traditional Asian cuisine - specifically regional Chinese food .Where have you travelled in China and what were your inspirations while there? We didn't just want to create yet another Cantonese restaurant, so again we tried to take inspiration from all over the region. I spent a while in the south around Sichuan and also travelled to Yunnan. I went to Beijing and discovered that in the city they have embassies for all the provinces in china where people go for regional visas etc. best of all they all have little cafes and restaurants where you can sample the regional cuisine, something not many people know. I recommend you go there with a local however as nobody speaks English. I also love visiting shanghai and Hong Kong. I've been to Shanghai four or five times. The first time I visited over ten years ago, it was a very different place with hardly any building occupied on The Bund, now it is thriving. For me you can't separate travel from food. That's the reason I travel, except when I ski (Perry and his family last skied in Aspen). One of my favourite places on the planet is San Sebastian, in the Basque country of Spain. There is brilliant food, fresh produce, and wonderful ingredients; everything is good here from tapas bars to Michelin stars. Then there is the light and the sea and the landscape. A very special restaurant there is Asador Etxebarri, (Ed: in the tiny leafy village of Axpe, halfway between San Sebastián and Bilbao). Arak and Mugartiz are also fantastic of course and both among the top fifty restaurants in the world. Where else do you love to travel and why? I love Tokyo. You can't get a bad meal there. The Japanese don't know how to take a shortcut so all the food is beautifully prepared and the ingredients are always fresh. It is the one place you know that the food in the train station is still going to be good. What are your favourite overseas restaurants? 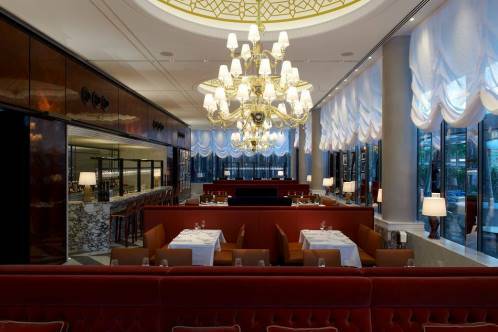 I am impressed by Thomas Keller's Per Se in New York, Heston Blumenthal does an amazing job at The Fat Duck (in Bray, England). I also like L'Arpege in Paris. What is the best meal you have ever had while travelling? Often the best meals are in unexpected places I remember a soup I got off a road-side stall in Thailand , which somebody once told me was often referred to as 'curried water' but this was amazing. It was a kind of laksa with pork balls and noodles. . I really love to eat noodles or pasta. Street stalls can be good; the best tacos in LA are from the taco trucks. What is your definition of a 'good' meal? Your cruise ship sinks. You're going to end up on a desert island. What three ingredients do you take from the kitchen? I guess if I'm on a desert island I could make my own sea salt. So lemons, chilli and olive oil. I am off to Melbourne, Perth and New Zealand. And then Paris and London. Neil Perry will be cooking a special Italian dinner at The Lodge at Kauri Cliffs, New Zealand on Saturday, 27 July at The Lodge at Kauri Cliffs. The dinner will consist of five fabulous Italian courses. A pre-dinner Disaronno Amaretto cocktail and reserve level Italian wines from Pasqua, Cecchi, Santa Margherita and Florio . For guests who chose to stay at the Lodge on the Friday night 26 July, there will be an intimate and relaxed cooking demonstration by Neil Perry the following morning - a great opportunity to chat to Neil and share in his passion for the best ingredients and simple technique. Tariff for the Saturday 27 July is at the special Winter Food & Wine series rate of NZ$800.00 + 15% GST per person per night based on double or twin occupancy, and includes accommodation in a suite at The Lodge at Kauri Cliffs, use of lodge facilities including the choice of either a day of unlimited green fees OR a 50 minute massage per person during the stay. Additional nights are available at the special NZ$600.00 + 15% GST per person per night.